This is a straight scan of my original manuscript, published in 1992. It doesn’t include the images that were in the published version but these can be found elsewhere on this site as well as a whole batch of images that did not make it into the book. The downloadable version also still contains all the errors that were pointed out after the book’s publication, particularly in the genealogical tables. I have not made any corrections in what is available here – although many errors and additions were reported to me. Hopefully I might get time to provide some of that additional and correcting data on this site in the future. Hi Sean I am a descendant of Timothy Brosnan and Mary Crowley and would love to meet you. Hello Sean, You have written a wonderful book here. I wonder if you have time, could you look at my dilemma and see is anything rings a bell with you. My gg grandmother was Deborah Brosnahan, who married Patrick Bowler in Kerry, Ireland. The family all seemed to be around Farranfore, Gearha, Firies. Their daughter, Margaret Bowler, baptized 1857 in Gearha, came to NZ at some stage and then in 1888, joined the St Joseph Convent in Tasmania. She said her parents were farmers in NZ, having come from Ireland. However, her father died in Ireland in 1859 and her mother never left Ireland. Her two brothers, Patrick and John Bowler did, however, go to NZ and lived in the Wanganui area. I have found a marriage in Gearha of Margaret Bowler and John Brosnahan in 1871. Margaret would have been 14 at the time, but that was legal then. I have just found this marriage so I am sending for the cert…….. However, reading your book, I see when Hugh Brosnahan went to NZ on the Star on India, there was also a 17 year old Margaret Brosnahan and John Brosnahan, although they are classed as “single”. This may or may not be them, as I’ve seen Hugh told lies about his age……so maybe that wasn’t the only lie. However, I cannot prove your Margaret is my Margaret. 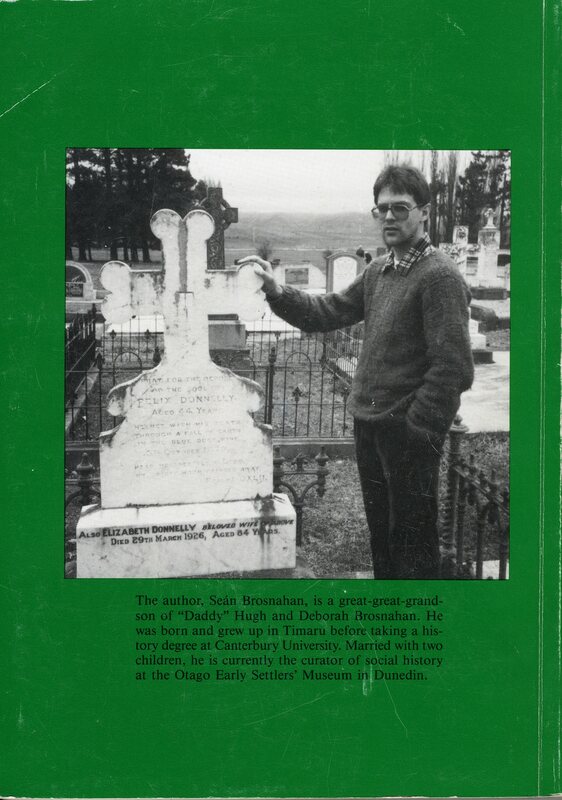 I will also buy John Brosnahan’s death cert from NZ to see if it shines any light on the possibility his wife ran off to the convent. This has all just come to light…….we always knew Margaret became Sister Vincent in Tassie, but nothing else. The odd thing about her story is that she is buried at Tunnack in Tassie, but her grave goes in a different direction to all the other nuns. Nobody from the order has been able to work out why. Now with this possible story, I wonder if she confessed to having a living husband on her deathbed and the priest made this decision. he would never have been able to tell anyone why. Thank you for reading my ramble…….the threads of family ties cane be very interesting. I presume that you and Liz (the previous comment) are working together on this. I’m not able to cast much light on your quandary except to say that the John Brosnahan who traveled to New Zealand in 1873 with his parents Hugh and Deborah and brother Cornelius was my great grandfather. I don’t think there’s much chance he was married to Margaret Bowler. He married Mary Foley in Temuka, New Zealand in 1883. I can’t imagine that he’d have been able to conceal a former spouse who’d gone on to Australia in the tight-knit community of inter-connected families that was Kerrytown! The “Margaret” who traveled with the family from Kerry remains a mystery but we simply don’t have much corroborating detail to pursue her any further. Sorry to dash cold water over your theory but it seems an unlikely scenario when set against the wider circumstances. I have been in contact with you in the past re obtaining a copy of your book. Delighted to see in the latest NZSG issue the book is now online and I am about to download it. My SUGRUE O’CONNELL TEAHAN and BUTLER lines all have links to Kerrytown. My SCULLY line also originates from Annaghdown. I hope you find the book useful. Are we related as Scullys? I am descended from John Scully of Pukerau, whose parents were William Scully and Annie Finnerty of Rakahouka. Hello Sean. I am so pleased to have found your website. I am descended from the Hoare family and have begun the amazing journey of tracing my family history including the Hoares. 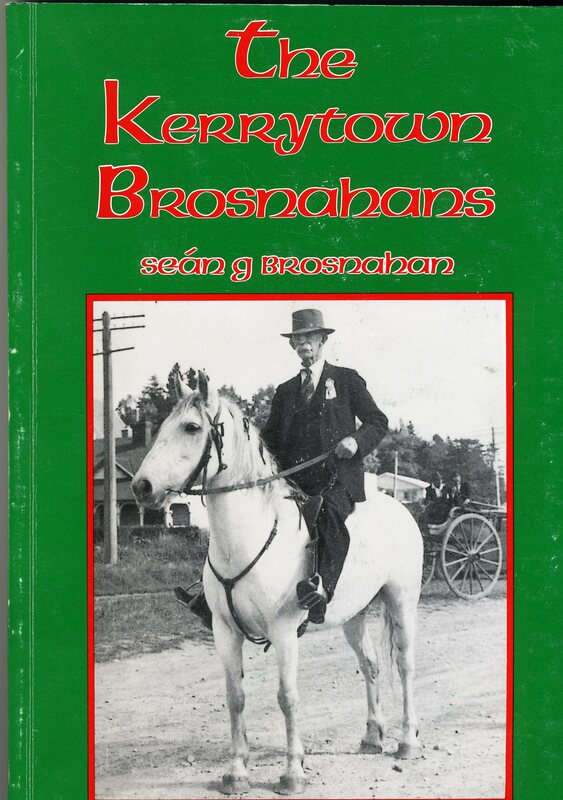 I would love to purchase a copy of your book The Kerrytown Brosnahans if you have one available. It would be great to catch up and I can fill you in more on where I am descended from. I look forward to hearing from you. Nice to hear from you and I hope the website is useful in your research. I’m afraid I don’t have any copies of the book – they sold out a number of years ago. That’s actually why I developed this site and posted the PDF of the manuscript to it. It means you can download the files and effectively have the book and print it out if you want a hard copy. Of course I had to post all the images separately but in fact that allowed me to put up a whole batch of images that I couldn’t fit into the 1992 book. Some of those are Hoare family ones so make sure you check those out too. They can be downloaded too. Despite having nine children, Dennis Hoare and Mary Brosnahan didn’t have too many descendants. Most of their lines of descent came to a deadened at some point. Are you descended from them or from Richard Hoare, Dennis’s brother? There is quite a lot of information on the internet about his family as well. I am descended from Richard Hoare who married Mary O’Connor. Richard was my great great grandfather and their daughter Julia Hoare was my great grandmother. It’s certainly a very interesting part of my family history. I will print off your book and photos. Thanks so much. I am going to be in Ireland in June so looking forward to being where many of my relatives came from. I am descended from Richard Hoare who married Mary O’Connor. Richard was my great great grandfather and his daughter, Julia Hoare, was my great grandmother. So Dennis Hoare was my great great uncle. It’s certainly a very interesting part of my family history and I can only imagine how tough life would have been in Kerrytown in those days. I will print off your book and photos. Thanks so much. I am going to be in Ireland in June and am looking forward to just being close to where these relatives came from. Thank you for your reply Sean. Sylvester Poff and his cousin James Barrett were hung in Tralee gaol in January 1883. Sylvester’s mother, Mary Barrett was my 2 x Great-grandmother. She died in 1911 just weeks after the 1911 census in Ireland. Unfortunately on the index she is recorded as Mary Duff, not Poff! She was living with her grandchildren at No 1 main Street, Castleisland. Some years ago I uplifted all the documents about the Poff and Barrett case, from National Archives in Dublin. They make for sad reading as one realises what a travesty of justice the two trials were. Sylvester Poff left a wife and 4 young children. His descendants today still live in Castleisland and one runs a business at number 1 Main Street, Castleisland. My grandfather was born in Makikihi, South Canterbury, just a year later from the hanging in Tralee gaol and was christened Sylvester Timothy Poff. The name Sylvester was a very old Palatine Irish name among many of the Palatine families, including the Poff family. When William Murphy Poff married Mary Barrett at Currow, a Protestant Church of Ireland, Palatine man entered the realm of Roman Catholic Ireland. William’s descendants were brought up in their mother’s Roman Catholic Church. However my mother and her siblings were brought up within their mother’s Anglican church here in New Zealand and not their father’s Roman Catholic church. Yes, I have found mentions of the Poff and Barrett case at Papers Past and also in online British newspapers. By the way the hangman was the famed/acclaimed/notorious Englishman,William Marwood. For the researchers in Kerry there are some old recordings of ballads about Poff and Barrett about their trial and the subsequent hangings. They are very moving to listen to. Hullo Sean, my late mother, Stephanie Cullen, was in contact with you many years ago with regards to the Brosnahan/Brosnan families of Kerrytown. She may have had a copy of your book but I am not sure where it is, so I am pleased to have access to the story here. Thank you for putting it all online. I am a Great-granddaughter of Johannah Brosnahan who married James Poff. Johannah was baptised in Killeentierna Parish, (Currow Church) and the family townland was Kilfelim. In retirement, James and Johannah Poff named their home, in Methven, Kilfelim House. I remember seeing information on this case in The NZ Tablet some years ago (when I was looking at 19th-century issues) so you’ll probably find it on Papers Past if you are familiar with that website. Let me know if you’re not. I also used to see Basil Poff quite regularly at history conferences and it was nice to have that Brosnahan connection. Thank you for putting your book out online. It was interesting to read you book and see why they fudged their ages on the passenger lists. Buried in the Temuka Cemetery is Hannah Crowley mother to Mary. It looks like Mary Crowley came out on the “Rakaia” in Feb. 1875 to Lyttelton and married Tim Brosan in 1878 [page 59]. Tim must have nominated Michael, John and Denis Crowley, Mary’s brothers, who came out on the “Boyne” in Feb. 1879. Denis worked on the Brosnan farm, Kerrytown.